Catch the team spirit! Custom University of Iowa Decals—the hot trend in vinyl car/wall decor! Show your school spirit and style with our University of Iowa Hawkeyes car/wall art. Our University of Iowa Herky Thumbs up with word Herky car/wall stickers spark a sign of your team spirit in your home, office or car decor. 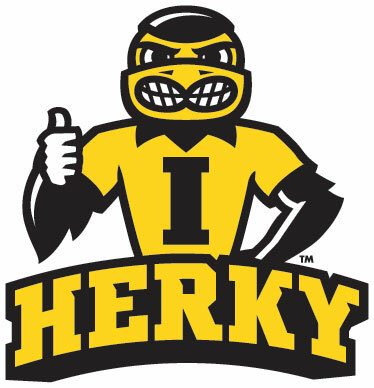 Iowa Herky Thumbs up is another decal in the New Herky Collection. Give a unique gift to that special student, fan or alumni! Imagine their delight in putting up an icon featuring their favorite mascot. Colors as indicated in picture, our featured University of Iowa Herky Thumbs Up with word Herky will give a notable look to your wall art as shown above. For Dramatic Impact in Small Spaces. "Fill up" an area with spirited wall art by placing a mascot decal on a wall. Child's Room. Place on wall behind a bed or next to a dresser to show your child's school spirit. Man Cave. Center above your focal point, e.g. a tv. Take your Team Spirit Everywhere. Proudly sport your University of Iowa Mascot by adding this to your cars window, laptop or iPad.